Dr. Parker received her DVM from Tufts University. She then completed a small animal internship at the Animal Medical Center in New York City, followed by a small animal internal medicine residency at Iowa State University and a clinical nutrition residency at Tufts University. She is a diplomate of both the American College of Veterinary Internal Medicine and the American College of Veterinary Nutrition. Dr. Parker’s primary areas of interest include kidney disease, gastrointestinal disease, and vitamin D metabolism, as well as nutritional management of dogs and cats. 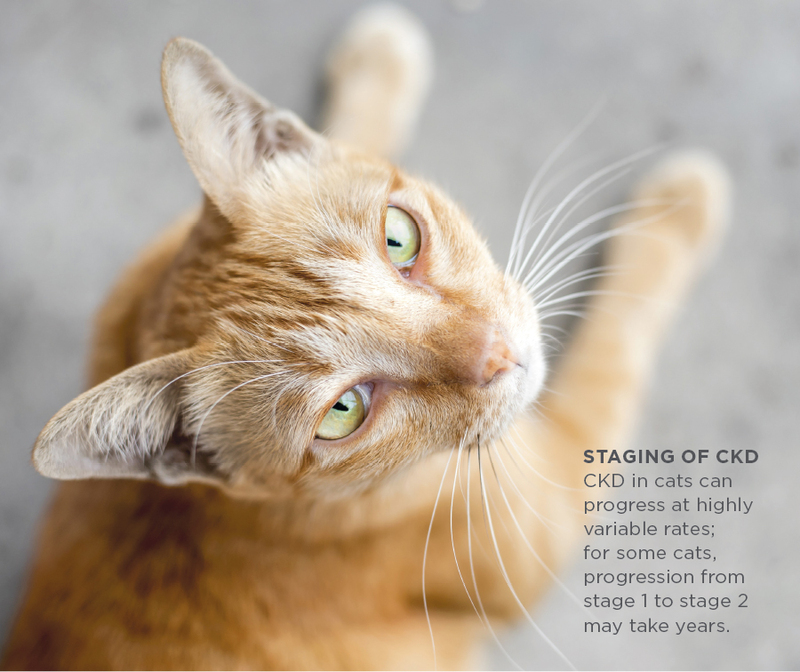 Chronic kidney disease (CKD) is one of the most commonly diagnosed conditions in older cats. A 1992 study of 2228 cats found 31% of cats older than 10 years to be affected1; a smaller and more recent study of a random cohort of cats found incidence to be 50%.2 New testing options may help you diagnose and intervene earlier in the disease process, but to ensure timely and appropriate intervention, you should base any diagnosis of CKD on a combination of those screening and confirmatory procedures. This article provides an overview of those diagnostic procedures; a follow-up article will focus on the nutritional management of cats with CKD. Because CKD is a common disease for older cats and can progress quietly for years before overt clinical signs are noted, annual screening of healthy cats should begin when they are approximately 5 to 6 years of age. This screening enables you to establish a baseline against which changes can be monitored over time. Components of CKD screening include a physical examination, blood testing, and urinalysis. Kidney palpation. Palpation can determine if kidneys are symmetrical and if they are enlarged or smaller than expected. Enlarged kidneys can be caused by ureteral obstruction, cystic changes, or infiltrative disease; abnormally small kidneys can be suggestive of CKD. Fundic exam. Hypertension is commonly associated with CKD in cats,4 and signs of hypertension may be evident before other signs of CKD are noted. Ocular changes, including retinal edema, intraretinal hemorrhage, tortuous vessels, detached retinas, and dilated pupils that are unresponsive to light, may be signs of hypertension caused by kidney disease. In an ideal world, blood pressure screening would be part of any routine examination; however, detection of ocular changes should prompt the measurement of systolic blood pressure if it was not part of the routine examination. You should not make a CKD diagnosis on the basis of 1 elevated creatinine or SDMA value without determining if the results are repeatable. For a confirmed diagnosis of CKD, abnormal findings should persist for at least 3 months. Blood testing. An annual blood screen that includes a complete blood count and chemistry profile with electrolytes is recommended. The complete blood count can help detect anemia, which is commonly mild and nonregenerative with CKD. After overt signs of CKD are present, some degree of azotemia (increased blood urea nitrogen [BUN] and creatinine) will be detected. Varying degrees of hyperphosphatemia will also be present and often worsen as CKD progresses. Like serum creatinine concentrations and glomerular filtration rate, symmetric dimethylarginine (SDMA)5,6 is a means of measuring renal function in cats. Serum SDMA concentrations are inversely proportional to glomerular filtration rate and may move out of the reference range before serum creatinine concentrations are increased. Thus, measurement of SDMA may allow earlier detection of renal disease. Although SDMA testing can be a complementary tool for CKD diagnosis, a single abnormal result does not confirm CKD, and you should not substitute SDMA findings for urinalysis and other diagnostic procedures. SDMA levels can fluctuate from day to day and be affected by factors such as hydration, diet, toxin ingestion, or medication use. A recent study showed significant variation in SDMA concentrations in healthy dogs sampled 9 times at various intervals.7 Therefore, you should always view SDMA findings within the context of the entire clinical picture. If the SDMA concentration is the only finding suggestive of CKD, you should re-test within 1 to 3 months to confirm repeatability. When screening test results alert practitioners to the possibility of CKD, confirming these findings completes the picture. Illness and dehydration, as well as acute toxin ingestion, can lead to abnormal screening findings, which may later be reversed. You should not make a CKD diagnosis on the basis of 1 elevated creatinine or SDMA value without determining if the results are repeatable. For a confirmed diagnosis of CKD, abnormal findings should persist for at least 3 months. Diagnostic imaging can provide additional useful information. Abdominal radiographs may enable assessment of kidney size, the presence of renal mineralization, and/or obstructive ureterolithiasis. Abdominal ultrasonography can offer additional information about the presence of decreased corticomedullary distinction (associated with CKD), hydronephrosis (often associated with ureteral obstruction), cysts, or infarcts. CKD in cats can progress at highly variable rates; for some cats, progression from stage 1 to stage 2 may take years. If repeated diagnostics indicate CKD, be cautious about prescribing a nonsteroidal anti-inflammatory drug for arthritis and consider switching high-protein, high-phosphorus diets to diets with more moderate protein and phosphorus levels. Note, however, that switching to a protein-restricted renal diet for a cat that does not have CKD may have undesirable effects. Such a diet can be detrimental because high-calorie, restricted-protein diets can promote unwanted weight gain and loss of lean muscle. Thus, confirmation of CKD is important. After a diagnosis of CKD has been established and the disease stage determined, you can create a patient management plan that includes medication and dietary modification. The next issue of Today’s Veterinary Practice will cover nutritional management of CKD in cats in a follow-up Nutrition Notes article. Lulich JP, Osborne CA, O’Brien TD, et al. Feline renal failure: questions, answers, questions. Compend Cont Educ Pract Vet 1992;14:127-152. Marino CL, Lascelles BD, Vaden SL. Prevalence and classification of chronic kidney disease in cats randomly selected from four age groups and in cats recruited for degenerative joint disease studies. J Feline Med Surg 2014;16(6):465–472. Freeman LM, Lachaud MP, Matthews S, et al. Evaluation of weight loss over time in cats with chronic kidney disease. J Vet Intern Med 2016;30(5):1661-1666. Bijsmans ES, Jepson RE, Change YM, et al. Changes in systolic blood pressure over time in healthy cats and cats with chronic kidney disease. J Vet Intern Med 2015;29(3):855-861. Hall JA, Yerramilli M, Obare E, et al. Comparison of serum concentrations of symmetric dimethylarginine and creatinine as kidney function biomarkers in cats with chronic kidney disease. J Vet Intern Med 2014;28:1676-1683. Braff J, Obare E, Yerramilli M, et al. Relationship between serum symmetric dimethylarginine concentration and glomerular filtration rate in cats. J Vet Intern Med 2014;28(6):1699-1701. Kopke MA, Burchell RK, Ruaux CG, et al. Variability of symmetric dimethylarginine in apparently healthy dogs. J Vet Intern Med 2018;32:736–742. Rishniw M, Bicalho R. Factors affecting urine specific gravity in apparently healthy cats presenting to first opinion practice for routine evaluation. J Feline Med Surg 2015;17(4):329-337. Syme HM, Markwell PJ, Pfeiffer D, Elliott J. Survival of cats with naturally occurring chronic renal failure is related to severity of proteinuria. J Vet Intern Med 2006;20:528–535. Peterson ME, Varela FV, Rishniw, Poizin DJ. Evaluation of serum symmetric dimethylarginine concentration as a marker for masked chronic kidney disease in cats with hyperthyroidism. J Vet Intern Med 2018;32:295-304.